Your barge cruise in Upper Loire takes you on ancient waterways through unspoiled countryside – the perfect way to experience this largely unknown region! For those who enjoy the discovery of travel, the emerging cruise region of the Upper Loire beckons with miles of pristine countryside. Within the inland waterways of this diverse region, a small collection of barges cruise the canals, inviting guests to discover a peaceful world of provincial beauty and pastoral allure. Often referred to as The Garden of Paris, or the “Gatinais”, the canals along the River Loire were built in the 16th and 17th century to supply its abundant produce to and from France’s capital. Cruise along some of France's most charming sights. The vineyards of Sancerre, with the most of pampered of Sauvignon Blanc grapes. The delightful town of Montargris, often called “Little Venice” due its latticework of 131 flower-adorned canals and bridges. France’s best “crottins”, or miniature drums of goat’s cheese, are made here. The Canal du Briare and the Canal du Loing. Construction on the Canal du Briare started in 1604 and was completed in 1642. The Canal du Loing was inspired by the poor navigability of the River Loing and the success of the Canal du Briare’s commercial activity, and was completed in 1723. Why Barge in Upper Loire? 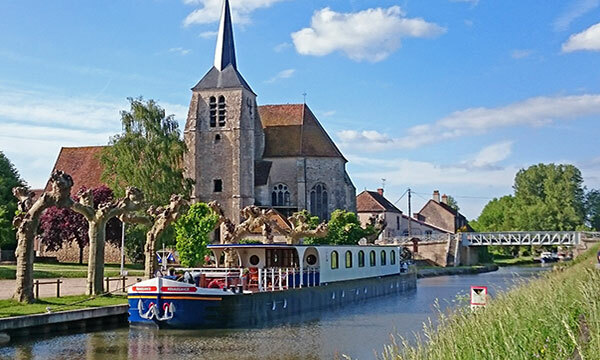 Only a two-hour drive from Paris, barges in the Upper Loire are confidently recommended for those who wish to enjoy time in the City of Light either before or after their cruise. Plentiful opportunities for walking and bicycling along the placid canal augment the experience, while the ever-present ambiance of the countryside’s history is a welcome companion.